Multicolor Beaded Peacock Lumba Rakhi with complimentary Roli Chawal. Peacock symbolizes feminine beauty, royalty, spirituality, awakening, and vision. It is a beautiful sight to see such mesmerizing peacock being carved against a red background. Greet your sister-in-law with this stunning piece of art and mesmerize her. It comes with the complimentary roli chawal. 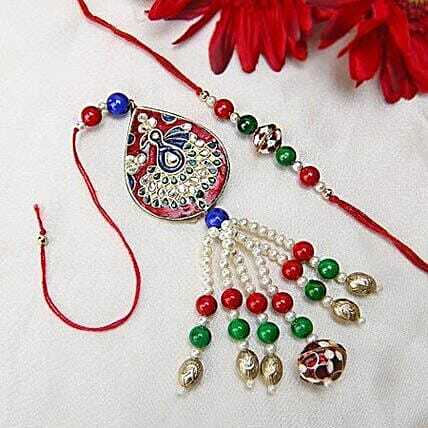 Keep your Rakhis separately so the threads don't get entangled.